14 KT. GOLD BRACELETS 100% Satisfaction GUARANTEED OR 100% $ RETURNED! SEE DEEP DISCOUNTED PRICE CHART! USING PAYPAL E-Payments is the SAFEST EASIEST PAYMENT METHOD just check the table below and CALCULATE THE PRICE AND CLICK HERE TO GO TO PAYPAL "SEND MONEY PAGE" USE THIS EMAIL TO SEND YOUR PAYMENT: DESIGNSJOHN1962@GMAIL.COM SEE PRICE LIST BELOW for TODAY'S price on your item or ANY questions. Or EMAIL ME for TODAY'S price on your item or ANY questions. All Gold items are stamped 14 Kt. Thousands of either WHITE or Yellow 14 Karat GOLD. We offer you designer Dance, Sports, Military, Religious, Nautical, Equestrian, Theatre, Performing arts, Tap Dance, Animals, Pets, Western, Patriotic Charms, Pendants, Earrings, Rings, or Bracelet Jewelry gifts. We have Sports gifts, Dance gifts, Military gifts, Religious gifts, performing arts, and country western dancing boots and hats. We have Baseball, Dance, Golf, Soccer, Skiing WHITE Snowboarding gifts, Basketball, Football, Cheering, Hockey, Tennis, Hunting and Fishing. We have U S A Flag pins, religion medals, Saints medals, Angel pins and pendants, Western cowboys embossed saddles and boots, straight and flush card hands for gamblers, American Indians gold jewelry chief heads, 14Kt GOLD chains. We have horse racing, horse riding, horse heads, miniature horses, horseshoe, horse jumping, quarter horses, unicorns wild horses in 14 Kt Gold Jewelry. All Gold items are stamped 14 Kt. Call 973-670-6767 for quick order. ALL NECKLACES ANY LENGTH, BRACELETS AVAILABLE IN ANY LENGTHS 7", 7 1/2", 8", 8 1/2". We will CREATE any bracelet or earrings from any item you see on any of our web sites. You can trust CRCreations.Com, CRCreation.Com, JewelryWoman.com, JewelryByCerutti.com, DesignsbyJohninc.Com, Equestrianjewelry.info, and Petjewelrydesigns.com in business since 1986 and on the Internet since 1996. NEW DEEP DISCOUNTED PRICE CHART BOTTOM OF PAGE! You can trust CRCreations.Com in business since 1986 and on the WWW since 1996. The name in gold that you have trusted since 1996. Every item is perfect in detail and design or your money back. We have Sports gifts, Dance gifts, Military gifts, Religious gifts, performing arts, and country western dancing boots and hats. We have Baseball, Dance, Golf, Soccer, Skiing WHITE Snowboarding gifts, Basketball, Football, Cheering, Hockey, Tennis, Hunting and Fishing. We have U S A Flag pins, religion medals, Saints medals, Angel pins and pendants, Western cowboys embossed saddles and boots, straight and flush card hands for gamblers, American Indians gold jewelry chief heads, 14Kt GOLD chains. We have horse racing, horse riding, horse heads, miniature horses, horseshoe, horse jumping, quarter horses, unicorns wild horses in 14 Kt Gold Jewelry. We have the largest selection of 14 Kt. holiday and best friends jewelry charms. All 14 Kt gold items are stamped 14 Kt and Made In The USA. We have charms in every sport ready for delivery and charm bracelets too ! We custom make tie tacks, cuff links or body jewelry from any of our designs. We can also make anything in white gold, yellow gold, 2 tone, or 3 tone gold. We have tap dance and tap dancing charms and pendants in 14 KT gold for the dance dance revolution. We distribute dance jewelry, ballet gifts, tap dance recital gifts made of 14 KT gold. We have dance dance dance revolution charms and dance shoes and ballerinas in 14 KT gold as well as drama and comedy and tragedy charms and comedy pendants in 14 KT gold. We carry golf jewelry such as golf club and golf bags in 14 KT gold. We distribute golf accessories such as clubs and bags in 14 KT. gold. These golf accessories gifts are made of 14 KT gold. We make tennis jewelry and tennis gifts as well as baseball jewelry and baseball charms to give as gifts for all occasions. We distribute track charms and track gifts too! 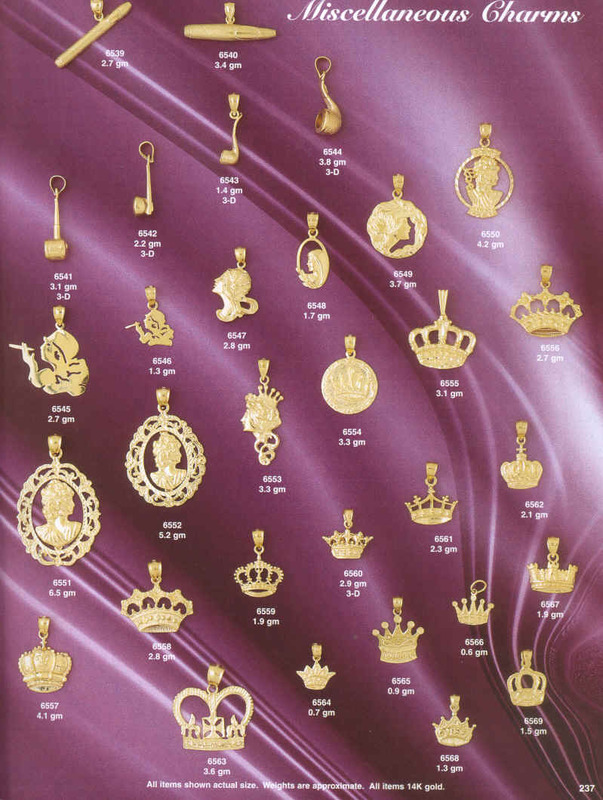 We carry bowling charms and bowling pendants and bowling medals in 14 KT gold. Cheering pendants and cheering charms are popular gifts for competitions, holiday and graduations gifts. Our soccer charms and soccer pendants are popular soccer gifts around the world. Our gold soccer ball sales have doubled with the recent Soccer world cup competition. We have golf jewelry, golf accessories and golf gifts in stock as well as golf accessories. We have basketball charms and basketballs in 14 KT gold. Additionally ballooning and windsurfing charms and surfing charms are big sellers here. We have a Large selection of 14 KT chains to go with your basketball charm or basketball pendant as well. Our line of police and military jewelry gifts has become our top seller. We have military insignia in 14 KT gold. We have supplied gold Air force, Naval, Coast Guard and Marine Corps pendants to our armed service people around the world. Our marine Corps jewelry designs are fabulous designs depicting the famous Marine corps Eagle globe and anchor. Professional Gifts for Police, Firemen, Military, Soldiers, Cowboys, gamblers, Military Pilots, Civilian Pilots and Actors, We have other jewelry such as our military planes and helicopters collection. Our jewelry is from every armed service and each piece is a detailed work of art, such as our Marine eagle globe and anchor pendants and Air Force charms pins and pendants. for retirement or promotion gifts. Our law enforcement line of jewelry has sheriff stars, police badges, hand cuffs, batons. We have many "BEST FRIENDS" charms and "BEST FRIENDS" pendants for you and your best friend. We all stay fit with weightlifting exercises and these fitness pendants. We have jewelry charms for track meets and tennis charms for tennis matches. We have tap dance and tap dancing charms and pendants in 14 KT gold for the dance dance revolution. We distribute dance jewelry, ballet gifts, tap dance recital gifts made of 14 KT gold. We have dance dance dance revolution charms and dance shoes and ballerinas in 14 KT gold as well as drama and comedy and tragedy charms and comedy pendants in 14 KT gold. We carry golf jewelry such as golf club and golf bags in 14 KT gold. We distribute golf accessories such as clubs and bags in 14 KT. gold. These golf accessories gifts are made of 14 KT gold. We make tennis jewelry and tennis gifts as well as baseball jewelry and baseball charms to give as gifts for all occasions. We distribute track charms and track gifts too! We carry bowling charms and bowling pendants and bowling medals in 14 KT gold. Cheering pendants and cheering charms are popular gifts for competitions, holiday and graduations gifts. Our soccer charms and soccer pendants are popular soccer gifts around the world. Our gold soccer ball sales have doubled with the recent Soccer world cup competition. We have golf jewelry, golf accessories and golf gifts in stock as well as golf accessories. We have basketball charms and basketballs in 14 KT gold. Additionally ballooning and windsurfing charms and surfing charms are big sellers here. We have a large selection of 14 KT chains to go with your basketball charm or basketball pendant as well. Our line of police and military jewelry gifts has become our top seller. We have military insignia in 14 KT gold. We have supplied gold Air force, Naval, Coast Guard and Marine Corps pendants to our armed service people around the world. Our marine Corps jewelry designs are fabulous designs depicting the famous Marine corps Eagle globe and anchor. Professional Gifts for Police, Firemen, Military, Soldiers, Cowboys, gamblers, Military Pilots, Civilian Pilots and Actors, We have other jewelry such as our military planes and helicopters collection. Our jewelry is from every armed service and each piece is a detailed work of art, such as our Marine eagle globe and anchor pendants and Air Force charms pins and pendants. for retirement or promotion gifts. Our law enforcement line of jewelry has sheriff stars, police badges, hand cuffs, batons. We have many "BEST FRIENDS" charms and "BEST FRIENDS" pendants for you and your best friend. We all stay fit with weightlifting exercises and these fitness pendants. We have jewelry charms for track meets and tennis charms for tennis matches. Families, Athletes and Sporting event sponsors and supply companies have been buying our unique 14 Kt. Gold and Rhinestone gifts for competitors, teachers, students, daughters and granddaughters for birthdays, holidays and competition gifts for many years. C. R. Creations custom 14 Kt. gold and rhinestone gifts have toured with national and local competitions such as Dance Educators of America, Eastern Performing Arts and NADDA to name a few. We have sold our fine gifts in many places such as New York City, Massachusetts, Connecticut, New Jersey and Pennsylvania. We guarantee all our products. Our products are purchased by and for all athletes, students, assistant teachers, instructors, teachers, Stars and company owners. Our customers call us on a regular basis for these extraordinary products and gifts of the highest quality. Therefore 24-carat gold is fine (99.9% Au w/w), 18-carat gold is 75% gold, 12-carat gold is 50% gold, and so forth. Historically, in England the carat was divisible into four grains, and the grain was divisible into four quarts. For example, a gold alloy of fineness (that is, 99.2% purity) could have been described as being 23-carat, 3-grain, 1-quart gold. Of all the precious metals, gold is the most popular as an investment. Investors generally buy gold as a hedge or safe haven against any economic, political, social, or fiat currency crises (including investment market declines, burgeoning national debt, currency failure, inflation, war and social unrest). The gold market is also subject to speculation as other commodities are, especially through the use of futures contracts and derivatives. The history of the gold standard, the role of gold reserves in central banking, gold's low correlation with other commodity prices, and its pricing in relation to fiat currencies during the financial crisis of 2007–2010, suggest that gold has features of being money. Hard Asset Investor: In your most recent report on Gold Demand Trends, the World Gold Council identifies two key drivers of the gold market in 2010: higher Gold Investment demand out of the US and Europe, and higher jewelry demand out of India and China. Which of these two factors is the stronger influence on today's market? Jason Toussaint: If we look at historical figures, we see that jewelry consumption leads all sectors, in terms of tonnage of demand. That will continue going forward, and jewelry would have the higher impact. That said, it might be worth noting that when we speak about the jewelry market in the non-US or the non-Western markets, the differentiation between a jewelry purchase for adornment and for investment is very great. It's very difficult to say that someone in the Indian gold market who's purchased gold jewelry is doing so exclusively for the jewelry aspect and not for investment, because there's a very liquid two-way market in that around the world. The bottom line is, and the common thread here is, gold is seen as a long-term store of wealth, which is keenly important in today's markets. "PLUMB GOLD A term used to describe gold jewelry that contains the precise amount of gold in the alloy that the Karat mark indicates. In the past an item marked 14Kt could legally have been 13.5 karat and still considered 14K. Today an item marked 14k must be at least 14 of 24 parts fine gold and is considered plumb gold. In some instances manufacturers have marked their jewelry 14KP meaning plumb, but inadvertently have confused the public that believed the 14KP mark meant gold plated. " Each 14 KT. Gold items here can be fashioned into earrings(2), Tie Tacks, Lapel Pins or Cuff links(2) for an additional gold and goldsmith charge . All 14 Kt gold items are stamped 14 KT and Made In The USA. You can trust CRCreations.Com in business since 1986 and on the WWW since 1996. We are your expert Jeweler and Gold Smith, ready to customize your choice. Use our request e-mail to get a price estimate and then order by fax. The price below includes 100% 14Kt. Gold, USA labor for casting, polishing and goldsmith cost for the pendants you see. The labor is a fixed cost despite the weight of the item. The clasp for the pendant is as shown and in most cases is will not change. *All Sizes approximated, outside of the USA shipping is extra, many items are available in diamond cut only, weights are approximate, all items 14 Kt gold unless otherwise named as rhinestone. When an item is measured, that measurement does include the clasp or bale. The "figure" or "piece" itself is measured with the clasp or bale. CR Creations specifications, prices and all aspects of the information on this web site are subject to change without notice. Errors and omissions are not the responsibility of CRCreations.com. You may return any unused and undamaged products purchased from us. If a difference of > 0.3 grams exists between the weight delivered to you and the item weight given on web page, price to buyer may be increased or decreased @ $4.00 per Tenth of a gram. Only one discount or special OFFER may apply to any one item purchased. This is not the official site of the NFL, NHL, NBA, MLB, or any other PRO or College Affiliated Team or teams web site or company. Any and all likeness to that site is strictly coincidental. We carry only 14 Kt Gold faux NFL mascot look alike Symbols and NON stamped "NFL" mascots or any other PRO or College Affiliated Team or teams web site or company look alike symbols THAT MAY RESEMBLE a PRO or College Affiliated Team or teams mascot. We have creative look alike symbols and mascots for many PRO or College Affiliated Team or teams mascots. "PLUMB GOLD A term used to describe gold jewelry that contains the precise amount of gold AND alloy that the Karat mark indicates. In the past an item marked 14 Kt could legally have been 13.5 karat and still considered 14 KT. Today THE LAW REQUIRES an item marked 14 KT must HAVE 14 of 24 parts fine gold and THEN IT IS considered plumb gold. WE SELL ONLY PLUMB GOLD, STAMPED AND MARKED. " I am John Cerutti and happy to hear from you again. Thank you again for visiting the many websites of John Cerutti. Your orders will be shipped ASAP by John Cerutti. Yes it will be delivered by US postal service. Yes you get a free gift box. Hi I'm John Cerutti and I will be handling your order every step of the way. John Cerutti sells only gorgeous 100 % 14 Kt plumb GOLD jewelry to you for Christmas. My products are 100 % 14 Kt gold or YOUR money back.